As you know, the general election is just six weeks from now. And early voting for 2016 gets under way in less than a month. Facing tall odds, Hawaii's Republican candidates are up against a mountain of Democrat Machine propaganda . So when HIRA learned that the Hawaii Republican Party blew all of its money in 2015 and 2016 on administrative overhead and on trying to purchase expensive real estate, we quickly realized that the state party would NOT be donating monies to its own candidates . . . as in previous years. So, HIRA has stepped in to fill the gap and show these brave candidates that we are in their corner. Yes, while our party continues to turn a deaf ear, HIRA listens to the voices of frustrated Republicans across the state. Therefore, to get the ball rolling, the Hawaii Republican Assembly's board of directors today selected four Republican candidates to which the HIRA has just sent financial contributions. Moreover, we urge all of you to help these and other brave Republicans on the ballot in 2016 with your money and voluntary campaign assistance. 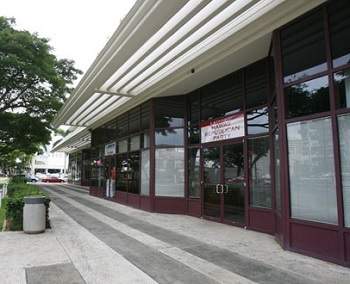 State Senator Sam Slom is being challenged by former City Councilman Stanley Chang to represent the 9th senate district (Hawaii Kai, Kuliouou, Niu, Aina Haina, Waialae-Kahala, Diamond Head) . Bryan Jeremiah is mounting his second consecutive challenge to freshman member of the State House Matt LoPresti - a progressive Democrat who is as liberal as they come - for the 41st house district (Ewa, Ewa Beach, Ewa Gentry, Ewa Villages, Hoakalei, Ocean Pointe). Scott Noltie has his sights set on unseating career politician Marcus Oshiro -- past majority leader of the Democrats in the State House under then Speaker Calvin Say -- for the 46th house district (Wahiawa, Whitmore Village). Emil Svrcina is running to unseat professional politician and liberal Democrat Ron Menor for the Honolulu City Council to represent the 9th council district (Waikele, Village Park, Royal Kunia, Mililani Town, West Loch, Iroquois Point, and portions of Ewa Villages and Ewa Beach). Emil will be the only candidate for City office in 2016 who is opposed to the rail project and to increasing taxes for that boondoggle. Donations to these GOP campaigns are underwritten by the tremendous members and donors of the Hawaii Republican Assembly (HIRA), which is a standard noncandidate committee regulated by the State Campaign Spending Commission. Even though leaders of the Hawaii Republican Party explicitly promised to help fund GOP candidates in 2016, they failed to come through. Still, HIRA renews its challenge to the RINO leaders of the Hawaii GOP to financially support their own candidates rather than merely blowing $15,000 per month of donor funds on ridiculously high overhead for an expensive headquarters (which isn't being used for any purpose which resembles victory). 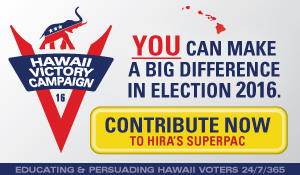 Meanwhile, the Hawaii Republican Assembly's official SuperPAC, HIRA Action, continues to invest in political communications through our " Hawaii Victory Campaign " which promote the Republican brand and solutions while educating the public about the harm done by failed Democrat policies and politicians. 100% of your donation goes directly to HIRA communications which reach the public. Not a single penny goes to "overhead" or "administration" or "office building" or "staff". Click HERE to learn more. While there's still time to help, please kokua in 2016 by making your own direct donations to the campaigns of these four courageous conservatives along with other brave, genuine Republicans on the ballot in 2016. Finally, HIRA vice president Marissa Kerns is still leading the official Trump signwaving campaign on Oahu. Please join Marissa's team at the entrance to Ewa Beach THIS FRIDAY, from 4pm to 6pm, in front of Queen's Medical Center on Fort Weaver Road. Over on the Big Island, check with Team Trump Kona's webpage for frequently updated signwaving opportunities.